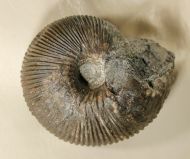 This is a Ammonite of the species Androgynoceras capricornus on matrix. 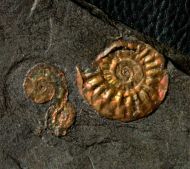 Here is a decorative Ammonite piece with two specimens of Kepplerites toricelli together with a lot of other fossils like fossil brachiopods and bivalves. 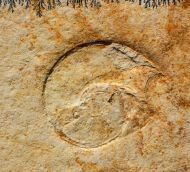 Here is a "Solnhofen Ammonite" of the species Lingulaticeras solenoides. 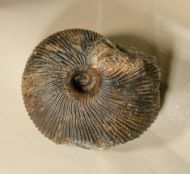 Here is a Ammonite of the species Macrocephalites macrocephalus from the Wittekind Flöz of the Porta Westfalica. 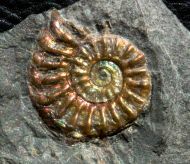 Here is a nicel Psiloceras johnstoni in a sparkling and colorful preservation. This is a attractive Ammonite plate from the lower Jurassic of Watchet in Somerset. 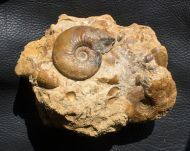 On this piece are one nice Psiloceras johnstoni together with two ammonites of the species Psiloceras planorbis. 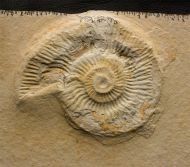 Here is a Ammonite of the species Psiloceras planorbis in a white colour. 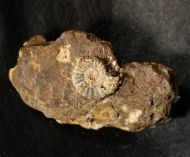 On the backside is a second specimen with about 12 mm in diameter. 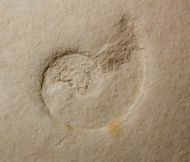 This is a nice Solnhofen Ammonite of the genus Subplanites that has a diameter of about 75 mm . 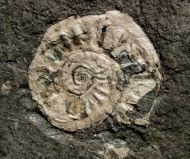 This "Solnhofen Ammonite" belongs to the species Neochetoceras sterapsis .